The person who creates a trust is called the creator, the settlor, or the grantor. The trustee is the person or persons who hold title to the trust property in their name. The trustee has a fiduciary duty to protect and manage the trust property for the benefit of the trust beneficiary. 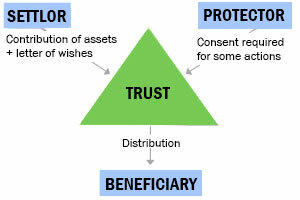 The beneficiary is the person or persons for whose benefit the trust is managed and administered. The creator of a trust can also be the trustee, the beneficiary, or both. A trustee who is not the creator can also be the beneficiary. So although the same person can occupy more than one role in a trust, each of the three roles remain separate and distinct. A trust is created by signing a trust agreement with the trustee and then transferring property into the name of the trust (which is referred to as funding the trust). A trust does not exist until property is actually transferred into it, even if a trust agreement is signed. It does not take a long time to form a trust – only as long as it takes to draft and sign a trust agreement and then complete the necessary steps (usually the completion of paperwork) to transfer the property into the name of the trust. A trust can cost anywhere from a few hundred dollars to thousands of dollars in legal fees, depending on the complexity of the trust agreement’s terms and the type and amount of property to be transferred into the trust. “The Parties Involved In A Trust” is discussed in more detail in my book “Nothing But The Truth About Estate Planning, Probate And Living Trusts”. Download your copy here: Nothing But The Truth About Estate Planning, Probate And Living Trusts by Larry Israeloff CPA & tax attorney.